Although Ca2+/calmodulin-dependent protein kinase II (CaMKII) is enriched at the presynaptic nerve terminal, its role in neurotransmitter release is poorly defined. We assessed the function of presynaptic CaMKII in neurotransmitter release and tested the hypothesis that BK channel is a mediator of presynaptic CaMKII function by analyzing miniature and evoked postsynaptic currents at the Caenorhabditis elegans neuromuscular junction. Both loss-of-function (lf) and gain-of-function (gf) of unc-43, the gene encoding CaMKII, inhibited neurotransmitter release. The inhibitory effect of unc-43(gf) was reversed by mutation or blockade of the BK channel SLO-1. SLO-1 expressed in Xenopus oocytes could be activated by recombinant rat α-CaMKII, and this effect of CaMKII was abolished by mutating a threonine residue (T425) at a consensus CaMKII phosphorylation site in the first RCK (regulator of conductance for K+) domain of the channel. Expression of slo-1(T425A) in neurons antagonized the inhibitory effect of unc-43(gf) on neurotransmitter release as slo-1(lf) did. The inhibitory effect of unc-43(gf) was not reversed by unc-103(lf), dgk-1(lf), or eat-16(lf), which reportedly suppress behavioral phenotypes of unc-43(gf). These observations suggest that presynaptic CaMKII is a bidirectional modulator of neurotransmitter release, presumably by phosphorylating different molecular targets, and that its negative modulatory effect on the release is mainly mediated by SLO-1 activation. Ca2+/calmodulin-dependent protein kinase II (CaMKII) is a key protein in controlling synaptic strength and plasticity (Lisman et al., 2002). CaMKII function at the postsynaptic site has been extensively studied. However, its function at the presynaptic site is poorly defined despite the finding that CaMKII is enriched at the presynaptic site and accounts for ∼2% of total synaptic vesicle proteins (Benfenati et al., 1992). 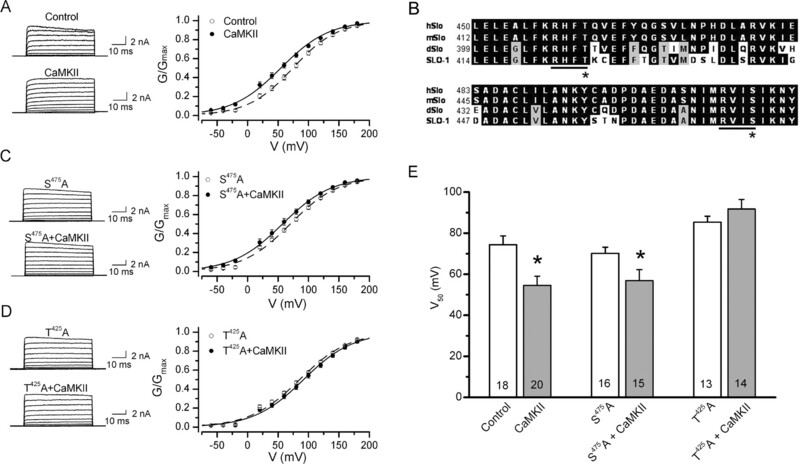 Injection of CaMKII into the presynaptic nerve terminal of the squid giant synapse enhances neurotransmitter release (Llinas et al., 1985), suggesting that the kinase is a positive regulator of release. In contrast, knock-out of presynaptic α-CaMKII enhances neurotransmitter release in mouse hippocampus, suggesting that the kinase is a negative regulator of release (Hinds et al., 2003). Mice heterozygous for a targeted mutation of α-CaMKII show blunted paired-pulse facilitation but enhanced posttetanic potentiation (Chapman et al., 1995), suggesting that the function of presynaptic CaMKII may vary depending on physiological or experimental conditions. CaMKII functions by phosphorylating other proteins. To understand the function of presynaptic CaMKII, it is important to identify its molecular targets. The BK channel is an attractive candidate. In virtually all synapses examined, the BK channel is a prominent K+ channel at presynaptic nerve endings (Anderson et al., 1988; Farley and Rudy, 1988; Lindgren and Moore, 1989; Tabti et al., 1989; Morita and Barrett, 1990; Sivaramakrishnan et al., 1991; Robitaille et al., 1993; Wangemann and Takeuchi, 1993; Katz et al., 1995; Vatanpour and Harvey, 1995; Knaus et al., 1996; Sun et al., 1999; Zhou et al., 1999; Yazejian et al., 2000; Misonou et al., 2006), where it colocalizes with voltage-gated Ca2+ channels (Robitaille et al., 1993; Issa and Hudspeth, 1994; Yazejian et al., 1997; Yazejian et al., 2000), and may serve as an important negative regulator of neurotransmitter release (Robitaille et al., 1993; Wang et al., 2001; Raffaelli et al., 2004). Several lines of evidence suggest that BK channel activity may be modulated by CaMKII: (1) BK channels reconstituted into artificial lipid bilayers are activated by ATP, which is blocked by a CaMKII inhibitor (Muller et al., 1996); (2) interactions between 14-3-3 and Slob, which are proteins that control Drosophila BK channel activity, may be modulated by CaMKII (Zhou et al., 1999); and (3) BK channels contribute to afterhyperpolarization of mouse vestibular nucleus neurons in a CaMKII-dependent manner (Nelson et al., 2005). Nevertheless, it remains to be determined whether presynaptic CaMKII may modulate neurotransmitter release through the BK channel. BK channel is not the only candidate through which presynaptic CaMKII might downregulate neurotransmitter release. In Drosophila, an ether-a-go-go (Eag) K+ channel may be phosphorylated by CaMKII (Wang et al., 2002), and expression of a constitutively active CaMKII in neurons causes failures of evoked synaptic responses at the neuromuscular junction (NMJ) (Park et al., 2002). However, it is unknown whether this inhibitory effect of CaMKII is mediated by the Eag K+ channel (Park et al., 2002). In Caenorhabditis elegans, loss-of-function (lf) mutations of UNC-103 (an Eag-related K+ channel) suppress unc-43 gain-of-function (gf)-caused inhibition of enteric muscle contractions; and lf mutations of GOA-1, DGK-1, EAT-11, and EAT-16, which are proteins in a Go/Gq G-protein signaling network, suppress several phenotypes of unc-43(gf), including defective locomotion and egg-laying, and reduced sensitivity to the cholinesterase inhibitor aldicarb (Robatzek and Thomas, 2000). However, it remains to be determined whether any of these C. elegans proteins may interact with UNC-43 to modulate neurotransmitter release. Using the C. elegans NMJ as a model synapse, we tested the hypothesis that presynaptic CaMKII may control neurotransmitter release by regulating BK channel activity. Whereas mammals have four CaMKII genes (Lisman et al., 2002), C. elegans has only one (Reiner et al., 1999; Rongo and Kaplan, 1999), which makes the analysis simpler. Our results suggest that presynaptic UNC-43 is a bidirectional modulator of neurotransmitter release and that its inhibitory effect on the release is mainly mediated by SLO-1. C. elegans were grown at room temperature (22–24°C) on agar plates with a layer of OP50 Escherichia coli (Sulston and Hodgkin, 1988). Adult hermaphrodite animals were used for physiological analysis. Postsynaptic currents [miniature postsynaptic currents (mPSCs) and evoked postsynaptic currents (ePSCs)] at the C. elegans NMJ were recorded as described previously (Wang et al., 2001; Liu et al., 2005). Briefly, an animal was immobilized on a glass coverslip by applying a cyanoacrylate adhesive along the dorsal side. A longitudinal incision was made in the dorsolateral region. After clearing the viscera, the cuticle flap was folded back and glued to the coverslip, exposing the ventral nerve cord and the two adjacent muscle quadrants. A Nikon (Tokyo, Japan) Eclipse E600FN microscope equipped with a 40× water-immersion lens and 15× eyepieces was used for viewing the preparation. Borosilicate glass pipettes with a tip resistance of 3∼5 MΩ were used as electrodes for voltage clamping. The classical whole-cell configuration was used to record mPSCs and ePSCs at a holding potential of −60 mV. ePSCs were evoked by applying a 0.5 ms square wave current pulse at a supramaximal voltage through a stimulation electrode placed in close apposition to the ventral nerve cord. Postsynaptic currents were amplified with a Multiclamp 700A amplifier (Molecular Devices, Union City, CA) and acquired with the Clampex software (Molecular Devices). Data were sampled at a rate of 10 kHz after filtering at 2 kHz. The recording pipette solution contained the following (in mm): 120 KCl, 20 KOH, 5 Tris, 0.25 CaCl2, 4 MgCl2, 36 sucrose, 5 EGTA, and 4 Na2ATP, pH adjusted to 7.2 with HCl. Unless specified otherwise, the external solution contained the following (in mm): 140 NaCl, 5 KCl, 5 CaCl2, 5 MgCl2, 11 dextrose, and 5 HEPES, pH adjusted to 7.2 with NaOH. Neuron-specific rescue of unc-43(js125) or slo-1(md1745) mutants was performed by expressing yfp::unc-43 cDNA (kindly provided by Joshua Kaplan, Massachusetts General Hospital, Boston, MA) or slo-1 cDNA under the control of the rab-3 promoter (Prab-3) (Nonet et al., 1997). Muscle-specific rescue of unc-43(lf) was performed by expressing gfp::unc-43 cDNA under the control of the myo-3 promoter (Pmyo-3) (Okkema et al., 1993). To express slo-1(T425A) in neurons, the mutation was introduced into the Prab-3::SLO-1 expression plasmid through site-directed mutagenesis. The cDNA splice forms of unc-43 and slo-1 used to make these expression constructs are K11E8.1g (www.wormbase.org) and slo-1a (Wang et al., 2001), respectively. Transgenic strains expressing Prab-3::YFP::UNC-43 (wp161), Pmyo-3::YFP::UNC-43 (wp144), Prab-3::SLO-1 (wp512), or Prab-3::SLO-1(T425A) (wp638) were obtained following standard procedures (Evans, 2006). Transformed animals expressing YFP::UNC-43 were identified by yellow fluorescent protein (YFP) fluorescence under a fluorescence microscope, whereas those expressing SLO-1 or SLO-1(T425A) were identified by coinjecting Prab-3::GFP (wp70) as a transformation marker. Transgenic animals expressing YFP::UNC-43 were analyzed after integrating the transgene by gamma irradiation (Evans, 2006) and backcrossing for at least three times. To express YFP::UNC-43 in both neurons and body wall muscle cells, the integrated transgene of Prab-3::YFP::UNC-43 was crossed into an integrated strain expressing Pmyo-3::YFP::UNC-43. Transgenic animals expressing Prab-3::SLO-1 or Prab-3::SLO-1(T425A) were analyzed without integration. Xenopus oocyte expression. Capped cRNA of the SLO-1a splice variant (with or without a point mutation) (Wang et al., 2001) was made with the mMessage mMachine kit (Ambion, Austin, TX). The cRNA was injected into oocytes (stage V or VI) using a Drummond Nanoject II Auo-Nanoliter Injector (Drummond Scientific, Broomall, PA). A total of 50 nl of SLO-1 cRNA (1 μg/μl) was injected per oocyte. Two to 4 d after cRNA injection, outside-out patches were obtained from the oocyte using borosilicate glass pipettes with a tip resistance of 1.7–2.5 MΩ. A series of voltage steps (−100 to +180 mV in 20 mV increments, 50 ms duration) were applied after a 40 ms prepulse at −120 mV before each voltage step. Macroscopic currents induced by the voltage steps were amplified with a Multiclamp 700A amplifier (Molecular Devices), and acquired with the Clampex software (Molecular Devices). Data were sampled at a rate of 10 kHz after filtering at 2 kHz. The solution facing the extracellular side of the patch membrane contained the following (in mm): 140 K+ gluconate, 2 hemiMg2+ gluconate, and 5 HEPES, pH 7.2. The solution facing the cytoplasmic side of the patch membrane (100 μm free Ca2+) contained the following (in mm): 140 K+ gluconate, 0.2 hemiCa2+ gluconate, and 10 HEPES, pH 7.2. Application of chemicals and recombinant CaMKII. Iberiotoxin and tubocurarine (Sigma, St. Louis, MO) were dissolved in water to 100× their final concentrations and kept as aliquots at −20°C. They were applied by pipetting into the recording chamber. Acetylcholine (ACh) or GABA, dissolved in the standard extracellular solution to its final concentration, was applied by puffing directly onto the body wall muscle cell through a glass micropipette. The puffing pressure pulse (0.2 psi; 0.1 s) was generated with a FemtoJet injector (Eppendorf, Hamburg, Germany). Recombinant rat CaMKII α-subunit (New England Biolabs, Ipswich, MA) was incubated with the 100 μm Ca2+ cytoplasmic solution (supplemented with 100 μm ATP magnesium and 1.2 μm calmodulin) at 30°C for 10 min to activate the kinase through autophosphorylation. The activated CaMKII (final concentration, 1000 U/ml) was applied to the cytoplasmic side of the patch through the pipette solution (the 100 μm Ca2+ cytoplasmic solution plus 200 μm ATP). In control experiments, the recombinant CaMKII α-subunit was heat-inactivated (80°C; 20 min) before the incubation with ATP and calmodulin. Analysis of unc-103 expression pattern. unc-103 expression pattern was evaluated by expressing green fluorescent protein (GFP) in vivo under the control of unc-103 promoter (Punc-103). A 3 kb unc-103 genomic fragment immediately upstream of the initiation site was cloned by PCR and fused in-frame to gfp. This plasmid (wp326) was injected into an integrated strain expressing red fluorescent protein (RFP) in all GABAergic neurons (a gift from Erik Jorgensen, University of Utah, Salt Lake City, UT) together with the cosmid C30D11, which contains the promoter and the 5′ portion of unc-103 coding region. Homologous recombination in vivo would result in a Punc-103::GFP transcriptional fusion containing the entire Punc-103 (Mello and Fire, 1995; Yuan et al., 2000; Liu et al., 2005). Epifluorescence of transgenic animals was visualized and photographed with a Nikon TE2000-U inverted microscope connected to a cooled monochrome digital camera (F-view II, Soft Imaging System, Munster, Germany). The fluorescein isothiocyanate and Texas Red filters (Chroma Technology, Rockingham, VT) were used for fluorescence imaging. Amplitude and frequency of mPSCs were analyzed using MiniAnalysis (Synaptosoft, Decatur, GA). A detection threshold of 10 pA was used in initial automatic analysis, followed by visual inspections to include missed events (≥5 pA) and to exclude false events resulting from baseline fluctuations. Amplitudes of ePSCs were measured with Clampfit (Molecular Devices). The averaged amplitude of the two largest peaks of ePSCs from each experiment was used for statistical analysis. Peak macroscopic currents from isolated oocyte patches were determined and used to plot the G–V relationship. The G–V relationship was fitted to the Boltzmann function: G = Gmax/[1 + exp(V50 − V)/k], where G is the conductance at voltage V, Gmax is the maximal conductance, V50 is the voltage at which G = 0.5Gmax, and k is the slope factor. Data were imported into Origin, version 7.5 (OriginLab, Northampton, MA), for graphing and statistical analysis. Either unpaired t test or one-way ANOVA (followed by Bonferroni's post hoc tests) was used for statistical comparisons. A value of p < 0.05 is considered statistically significant. All values are expressed as mean ± SE. n is the number of patches or muscle cells that were recorded from. To test the hypothesis that presynaptic CaMKII may downregulate neurotransmitter release by activating the BK channel, we first analyzed neuromuscular transmission in unc-43(gf). The allele analyzed was unc-43(n498), in which a single amino acid substitution (E108K) makes the kinase partially active even in the absence of Ca2+ (Reiner et al., 1999; Umemura et al., 2005). We observed that the amplitude of ePSC was reduced by 50%, but neither the frequency nor the amplitude of mPSC was altered in unc-43(gf) (Fig. 1). The normal mPSC amplitude suggests that postsynaptic receptor sensitivity was unaltered in unc-43(gf). Thus, the decreased ePSC amplitude in unc-43(gf) most likely reflected decreased evoked neurotransmitter release. unc-43(gf) and slo-1(gf) mutations inhibited the amplitude of ePSCs at the C. elegans neuromuscular junction, and this effect of unc-43(gf) could be reversed by slo-1(lf) or application of the BK channel blocker iberiotoxin (IBTX) (200 nm). The mutant alleles used were unc-43(n498), slo-1(ky399), and slo-1(md1745). A, Representative traces of mPSCs (top) and ePSCs (bottom) from wild type (WT), unc-43(gf), slo-1(gf), slo-1(lf), unc-43(gf);slo-1(lf), and unc-43(gf) with IBTX. B, Comparison of mPSC frequency, mPSC amplitude, and ePSC amplitude. All values are shown as the mean ± SE. The asterisk indicates statistically significant difference (p < 0.05, one-way ANOVA with Bonferroni's post hoc tests). The number of samples analyzed is indicated inside each column. If the inhibition of neurotransmitter release by unc-43(gf) was attributable to hyperactivation of SLO-1, SLO-1 dysfunction would reverse the effect of unc-43(gf) on ePSC amplitude. Indeed, the reduction of ePSC amplitude in unc-43(gf) was completely reversed in unc-43(gf);slo-1(lf) double mutant (Fig. 1). The slo-1 allele used in the analysis was md1745, which is likely a null because a premature stop codon truncated the channel at the intracellular loop between the first and second membrane-spanning domains (S0 and S1) (Wang et al., 2001). Consistently, application of the BK channel blocker iberiotoxin (200 nm) to unc-43(gf) also restored ePSC amplitude to wild-type level (Fig. 1). Because acute SLO-1 blockade and slo-1(lf) similarly counteracted the effect of unc-43(gf) on ePSC amplitude, the effect of slo-1(lf) was attributable to SLO-1 dysfunction rather than a secondary developmental effect. Although slo-1(lf) reversed the inhibition of ePSC amplitude caused by unc-43(gf), it did not increase ePSC amplitude by itself under the current experimental conditions with 5 mm [Ca2+]o (Fig. 1), which is probably attributable to depletion of the readily releasable synaptic vesicle pool (Wang et al., 2001). Consistent with this notion, slo-1(lf) caused a significant increase of ePSC amplitude under conditions when ePSC amplitude was small (in the presence of 250 or 500 μm [Ca2+]o) but not under conditions when ePSC amplitude was large (in the presence of 1 or 5 mm [Ca2+]o) (supplemental Fig. 1, available at www.jneurosci.org as supplemental material). At 500 μm [Ca2+]o, application of iberiotoxin augmented ePSC amplitude in wild type but in slo-1(lf) mutant (supplemental Fig. 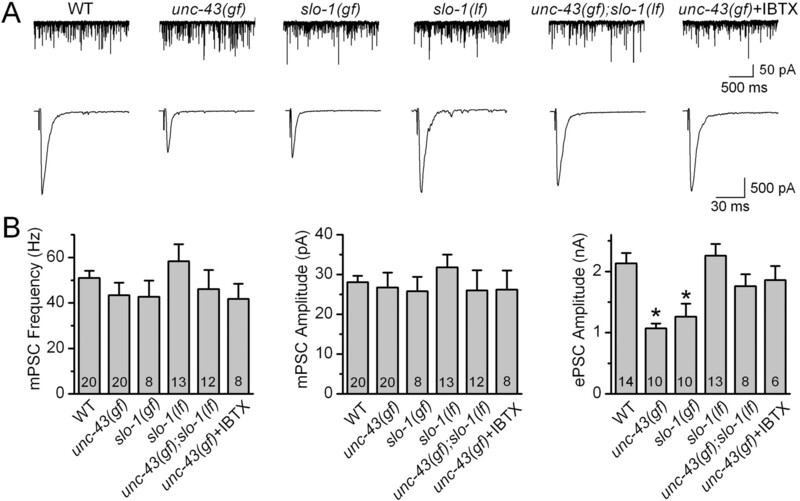 2, available at www.jneurosci.org as supplemental material), suggesting that the effect of iberiotoxin on ePSC amplitude in wild type or unc-43(gf) was attributable to SLO-1 blockade rather than a nonspecific effect. There were two possible mechanisms for the restoration of ePSC amplitude by SLO-1 dysfunction: (1) neurotransmitter release was decreased in unc-43(gf) because of hyperactivation of SLO-1 by UNC-43, and dysfunction of SLO-1 eliminated this hyperactivated K+ channel; and (2) independent actions of unc-43(gf) to inhibit and SLO-1 dysfunction to augment the release neutralized each other. As detailed below, unc-43(lf) also inhibited ePSC amplitude. If the second possibility was true, slo-1(lf) would be able to counteract the reduction of ePSC amplitude caused by unc-43(lf). However, a comparison of ePSC amplitudes between unc-43(lf) and the double mutant unc-43(lf);slo-1(lf) showed that slo-1(lf) had no effect on the inhibitory effect of unc-43(lf) on ePSC amplitude (Fig. 2). Thus, the effect of slo-1(lf) or iberiotoxin on ePSC amplitude in the genetic background of unc-43(gf) was most likely attributable to elimination of a hyperactivated SLO-1. slo-1(lf) mutation did not suppress synaptic transmission defects caused by unc-43(lf) at the C. elegans neuromuscular junction. The mutant alleles analyzed were slo-1(md1745) and unc-43(js125). A, Representative traces of mPSCs (top) and ePSCs (bottom) from wild type (WT), unc-43(lf), and unc-43(lf);slo-1(lf). B, Comparison of mPSC frequency, mPSC amplitude, and ePSC amplitude. All values are shown as the mean ± SE. The asterisk indicates statistically significant difference (p < 0.05, one-way ANOVA with Bonferroni's post hoc tests). The number of samples analyzed is indicated inside each column. We also analyzed neuromuscular transmission in slo-1(ky399), which is a gf mutant caused by a E350K mutation near the bottom of the S6 membrane spanning domain (Davies et al., 2003). slo-1(ky399) mutant shows significant resistance to the paralytic effect of the cholinesterase inhibitor aldicarb, suggesting that acetylcholine release might be decreased in this mutant (Davies et al., 2003). Indeed, we found that ePSC amplitude was reduced by ∼40%, but mPSC amplitude was normal in this mutant (Fig. 1), confirming that acetylcholine release is decreased at the NMJ in this mutant. Thus, activation of SLO-1 could potentially mediate the inhibitory effect of unc-43(gf) on neurotransmitter release. UNC-43 could activate SLO-1 by phosphorylating either the channel or a SLO-1 regulatory protein. To determine whether SLO-1 is likely a direct molecular target of CaMKII phosphorylation, we tested the effect of recombinant rat α-CaMKII on the activity of SLO-1 expressed in Xenopus oocyte. Application of activated recombinant rat CaMKII α-subunit (1 U/μl) shifted the voltage activation range of SLO-1 toward more hyperpolarized potentials by ∼20 mV (Fig. 3A,E), suggesting that SLO-1 was activated by CaMKII. To test whether CaMKII may activate SLO-1 by directly phosphorylating the channel protein, we mutated candidate CaMKII phosphorylation sites in SLO-1 and tested the effect of recombinant CaMKII on the mutated channel. Candidate CaMKII phosphorylation sites were identified according to three criteria: (1) they conform to the consensus CaMKII phosphorylation sequence R-X-X-S/T (Hanson et al., 1989), (2) they are located on the cytoplasmic side according to the predicted membrane topology of BK channels (Meera et al., 1997), and (3) they are conserved among BK channels from humans, mice, Drosophila, and C. elegans. Two such candidate CaMKII phosphorylation sites (“RHFT” and “RVIS”) were identified, and both are located in the first regulator of conductance for K+ (RCK) domain (Jiang et al., 2002) within the carboxyl-terminal tail of the channel (Fig. 3B). A S475A mutation at the second candidate site showed no significant effect on SLO-1 activation by the recombinant CaMKII (Fig. 3C,E). In contrast, a T425A mutation at the first candidate site prevented SLO-1 activation by CaMKII (Fig. 3D,E), suggesting that CaMKII might directly activate SLO-1 by phosphorylating T425. Interestingly, T425A mutation alone shifted the V50 of SLO-1 activation by approximately +20 mV (Fig. 3E), which emphasizes the importance of T425 in SLO-1 gating. CaMKII stimulated SLO-1 activity in outside-out patches from Xenopus oocytes expressing SLO-1, and this effect was abolished by SLO-1 T425A but not S475A mutation. Either autophosphorylated (CaMKII) or heat-inactivated (Control) rat recombinant α-CaMKII was applied to the cytoplasmic side of the patch membrane through the recording pipette. A, Representative current traces and conductance (G)–voltage (V) relationship showing SLO-1 activation by CaMKII. The G–V relationship was fitted to a Boltzmann function. B, Alignment of BK channels of human (hSlo), mouse (mSlo), Drosophila (dSlo), and C. elegans showing two consensus CaMKII phosphorylation sites (R-X-X-S/T). The asterisk indicates SLO-1 T425 or SLO-1 S475. C, Representative current traces and G–V relationship showing that SLO-1 S475A was still activated by CaMKII. D, Representative current traces and G–V relationship showing that SLO-1 T425A was not activated by CaMKII. E, Comparison of the half-maximal voltage for SLO-1 activation (V50). CaMKII significantly decreased the V50 of wild-type SLO-1 and SLO-1 S475A, but not of SLO-1 T425A (p < 0.05, unpaired t test). All values are shown as the mean ± SE. The number of samples analyzed is indicated inside each column. To confirm that SLO-1 T425 is important to UNC-43-dependent regulation of neurotransmitter release in vivo, we tested whether the inhibitory effect of unc-43(gf) on neurotransmitter release could be abolished by the SLO-1 T425A mutation in transgenic worms. Either wild-type SLO-1 or SLO-1(T425A) was expressed in neurons of unc-43(gf);slo-1(lf) double mutant under the control of Prab-3 (Nonet et al., 1997). Expression of wild-type SLO-1 unmasked the inhibitory effect of unc-43(gf) on ePSC amplitude without affecting mPSC properties (Fig. 4). In contrast, expression of SLO-1(T425A) did not show such an effect (Fig. 4). These observations suggest that the inhibitory effect of unc-43(gf) on neurotransmitter release at the NMJ is primarily mediated by phosphorylation of SLO-1 at T425. SLO-1 T425A mutation abolished the inhibitory effect of unc-43(gf) on neurotransmitter release at the C. elegans neuromuscular junction. Either wild-type SLO-1 or SLO-1(T425A) was expressed in unc-43(n498);slo-1(md1745) double mutant under the control of the neuron-specific Prab-3, which restricts expression of the transgene to the presynaptic site at the neuromuscular junction. A, Representative traces of mPSCs and ePSCs from the double mutant (Control), the double mutant expressing Prab-3::SLO-1, and the double mutant expressing Prab-3::SLO-1(T425A). B, Comparison of mPSC frequency, mPSC amplitude, and ePSC amplitude. All values are shown as the mean ± SE. The asterisk indicates statistically significant difference (p < 0.05, one-way ANOVA with Bonferroni's post hoc tests). The number of samples analyzed is indicated inside each column. To determine whether the inhibitory effect of unc-43(gf) on synaptic transmission might be partially mediated by UNC-103, we analyzed the effect of unc-103(lf) on mPSCs and ePSCs in the presence and absence of unc-43(gf). The unc-103 allele analyzed was n1213, which deletes the majority of exons of unc-103 (Reiner et al., 2006). We found that properties of mPSCs and ePSCs were indistinguishable between wild type and unc-103(lf), and between unc-43(gf) and the double mutant unc-43(gf);unc-103(lf) (Fig. 5A,B), suggesting that UNC-103 did not mediate the inhibitory effect of unc-43(gf) on synaptic transmission. lf mutation of unc-103, dgk-1, or eat-16 did not augment neurotransmitter release either in the presence or in the absence of unc-43(gf). The mutant alleles used were unc-103(n1213), dgk-1(sy428), eat-16(sa609), and unc-43(n498). A, Representative traces of mPSCs (top) and ePSCs (bottom). B, Comparison of mPSC frequency, mPSC amplitude, and ePSC amplitude. All values are shown as the mean ± SE. One-way ANOVA with Bonferroni's post hoc tests was used to compare between wild type and each of the three single mutants (open columns), and between unc-43(gf) and each of the three double mutants (filled columns). The asterisk indicates statistically significant difference compared with the wild type (WT) (p < 0.05). There was no significant difference among the groups containing unc-43(gf). The number of samples analyzed is indicated inside each column. C, unc-103 expression along the ventral cord was restricted to GABAergic motor neurons. The unc-103 expression pattern was evaluated by expressing Punc-103::GFP. GABAergic neurons were labeled by expressing Punc-47::RFP. Yellow-colored neurons in the merged pictures are GABAergic neurons that express unc-103. The left panels show images of a young adult (scale bar, 100 μm), whereas the right panels show images of a larva (scale bar, 50 μm). unc-103 expression was observed in many head neurons (arrow), GABAergic motor neurons (asterisks), and the vulval muscle (arrowhead). For clarity, GABAergic motor neurons of the young adult are not labeled. DIC, Differential interference contrast. The lack of effect of unc-103(lf) on ePSC amplitude was in agreement with unc-103 expression pattern in C. elegans. A Punc-103::GFP transcriptional fusion was expressed in many neurons in the nervous system, including some motor neurons along the ventral cord (Fig. 5C). Interestingly, expression along the ventral cord appeared restricted to GABAergic motor neurons, which were labeled by expressing a transcriptional fusion of Punc-47::RFP (Fig. 5C). Because only cholinergic transmission contributes to ePSCs at the C. elegans NMJ under the current experimental conditions (Liu et al., 2005), it is not surprising that unc-103(lf) did not alter ePSC amplitude. The suppression of unc-43(gf) behavioral phenotypes by mutants of dgk-1, goa-1, eat-11, or eat-16 (Robatzek and Thomas, 2000) raises the question whether synaptic phenotypes of unc-43(gf) might be partially mediated by an imbalance between the Go and Gq signaling pathways. To test this possibility, we examined the effects of dgk-1(lf) and eat-16(lf) on mPSCs and ePSCs at the NMJ. dgk-1 and eat-16 were chosen for the analysis because among the four genes that have been implicated in antagonizing the behavioral phenotypes of unc-43(gf) (Robatzek and Thomas, 2000), dgk-1 and eat-16 affect the Go and Gq signaling pathways, respectively. goa-1 and eat-11 were not chosen for the analysis because GOA-1 appears to be upstream of DGK-1 in the Go signaling pathway, and EAT-11 is implicated in both the Go and Gq pathways but its function is unclear (Robatzek et al., 2001; Patikoglou and Koelle, 2002). The mutant alleles analyzed were dgk-1(sy428), which is an early nonsense mutation resulting in no detectable DKG-1 protein (Jose and Koelle, 2005), and eat-16(sa609), which is a missense mutation of a conserved arginine to cysteine and behaves genetically as a null (Hajdu-Cronin et al., 1999). Neither dgk-1(lf) nor eat-16(lf) antagonized the inhibitory effect of unc-43(gf) on ePSC amplitude (Fig. 5A,B). Interestingly, ePSC amplitude was significantly reduced in eat-16(lf), and mPSC amplitude was significantly reduced in both eat-16(lf) and dgk-1(lf). The fact that neither dgk-1(lf) nor eat-16(lf) corrected the inhibitory effect of unc-43(gf) on ePSC amplitude suggests that their suppression of unc-43(gf) behavioral phenotypes was not attributable to improved cholinergic transmission at the NMJ. We also analyzed mPSCs and ePSCs at the NMJ of unc-43(js125), a putative null with the first 10 exons deleted (Hawasli et al., 2004). 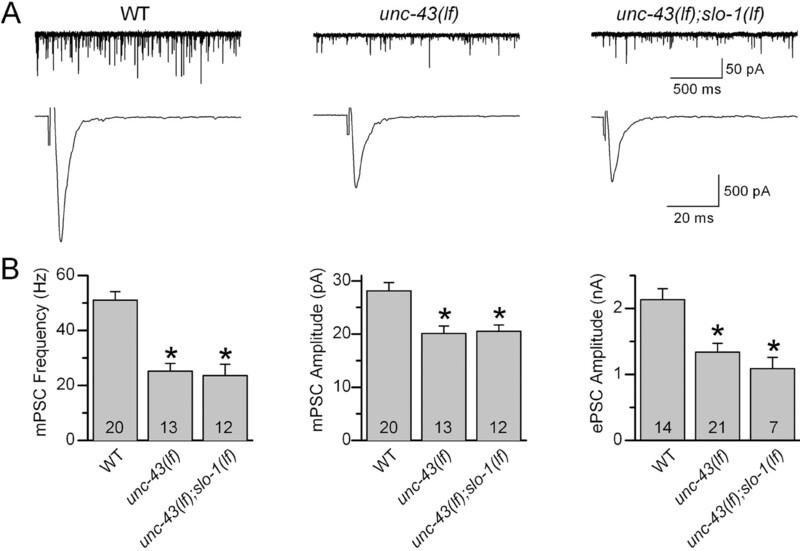 If the function of presynaptic UNC-43 at the NMJ is only to downregulate neurotransmitter release, we would expect to see increased ePSC amplitudes in the unc-43(lf) mutant. Instead, unc-43(lf) showed decreased ePSC amplitude as well as decreased mPSC frequency and amplitude (Fig. 6). ePSC amplitude reduced by 23%, and mPSC frequency and amplitude reduced by 46 and 23%, respectively, compared with those of the wild type. These synaptic transmission defects were attributable to deficiency of UNC-43 because they could be rescued completely by expressing YFP::UNC-43 in neurons and body wall muscle cells under the independent controls of the neuron-specific Prab-3 (Nonet et al., 1997) and the muscle-specific Pmyo-3 (Okkema et al., 1993) (Fig. 6). Expression of YFP::UNC-43 in neurons alone rescued mPSC frequency and ePSC amplitude but not mPSC amplitude, whereas expression of YFP::UNC-43 in muscle cells alone rescued mPSC amplitude but not mPSC frequency or ePSC amplitude (Fig. 6). These observations confirmed that YFP::UNC-43 is functional, as reported by others (Rongo and Kaplan, 1999), and suggest that both presynaptic release probability and postsynaptic receptor sensitivity might be defective at the NMJ in unc-43(lf). unc-43(lf) mutation inhibited mPSCs and ePSCs at the C. elegans neuromuscular junction, and these defects could be rescued by expressing YFP::UNC-43 under the independent controls of the neuron-specific Prab-3 and the muscle-specific Pmyo-3. The unc-43(lf) allele analyzed was js125. A, Representative traces of mPSCs and ePSCs from wild type (WT), unc-43(lf), unc-43(lf) with neuron- and muscle-specific rescue (N+M), unc-43(lf) with neuron-specific rescue (N), and unc-43(lf) with muscle-specific rescue (M). B, Comparison of mPSC frequency, mPSC amplitude, and ePSC amplitude. All values are shown as the mean ± SE. The asterisk indicates statistically significant difference (p < 0.05) compared with WT (one-way ANOVA with Bonferroni's post hoc tests). The number of samples analyzed is indicated inside each column. The C. elegans NMJ is innervated by both excitatory cholinergic and inhibitory GABAergic motor neurons. To test whether postsynaptic receptor sensitivity to ACh or GABA was reduced in unc-43(lf), we compared responses of body wall muscle cells to exogenous neurotransmitters between wild type and the mutant. 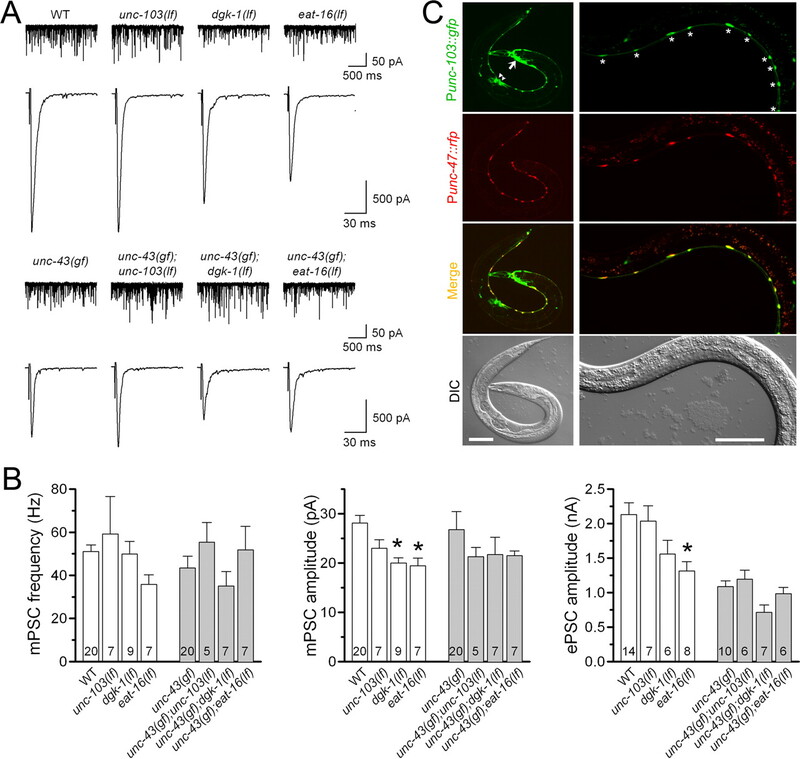 Although ACh and GABA receptors at the C. elegans NMJ normally pass inward and outward currents, respectively, both of them conducted inward currents under our experimental conditions because of the negative holding potential (−60 mV) and the specific compositions of the pipette and extracellular solutions. We found that the amplitude of ACh-induced currents was similar between the wild type and unc-43(lf), whereas that of GABA-induced currents was significantly smaller in the mutant (Fig. 7A), suggesting that postsynaptic receptor sensitivity to ACh was normal but that to GABA was reduced in unc-43(lf). To confirm that postsynaptic ACh and GABA receptors are affected differently by unc-43(lf), we analyzed the effect of unc-43(lf) on cholinergic and GABAergic mPSCs independently. Cholinergic mPSCs were isolated by using the unc-49(e407) mutant, whereas GABAergic mPSCs were isolated by applying tubocurarine. GABAergic mPSCs are completely absent in unc-49(e407) (Richmond and Jorgensen, 1999) because unc-49(e407) is a null mutant of GABA receptors (Bamber et al., 1999), whereas cholinergic mPSCs at the C. elegans NMJ are eliminated by tubocurarine (Richmond and Jorgensen, 1999). We found that unc-43(lf) reduced the amplitude of only GABAergic mPSCs (Fig. 7B), which is consistent with the results of puffing exogenous ACh and GABA. 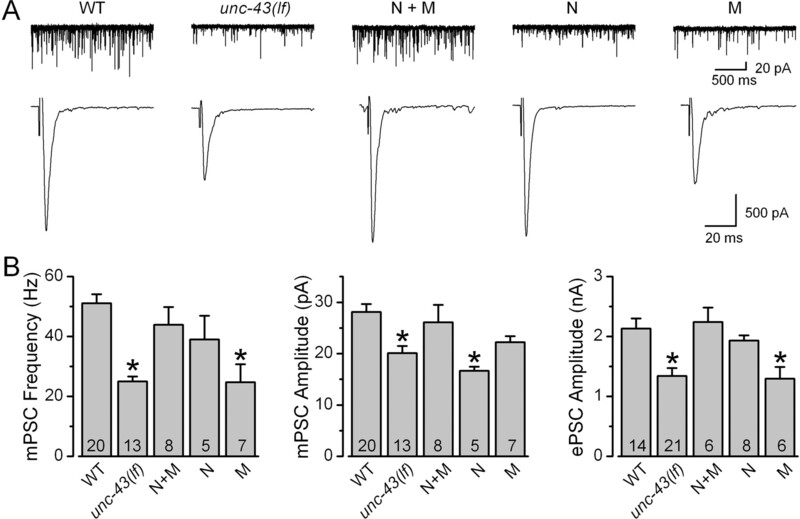 Because ePSCs at the C. elegans NMJ are entirely attributable to cholinergic transmission under our experimental conditions (Liu et al., 2005), the normal postsynaptic receptor sensitivity to ACh suggests that the reduced ePSC amplitude in unc-43(lf) reflected a decrease of presynaptic release rather than of postsynaptic receptor sensitivity. Thus, presynaptic UNC-43 is also required to maintain normal neurotransmitter release at NMJs. Postsynaptic receptor sensitivity of body wall muscle cells to ACh was normal but that to GABA was decreased in an unc-43(lf) mutant. A, Responses of body wall muscle cells to exogenous or GABA (200 μm) but not ACh (200 μm) was significantly reduced in unc-43(lf) (the js125 allele) compared with wild type (WT). 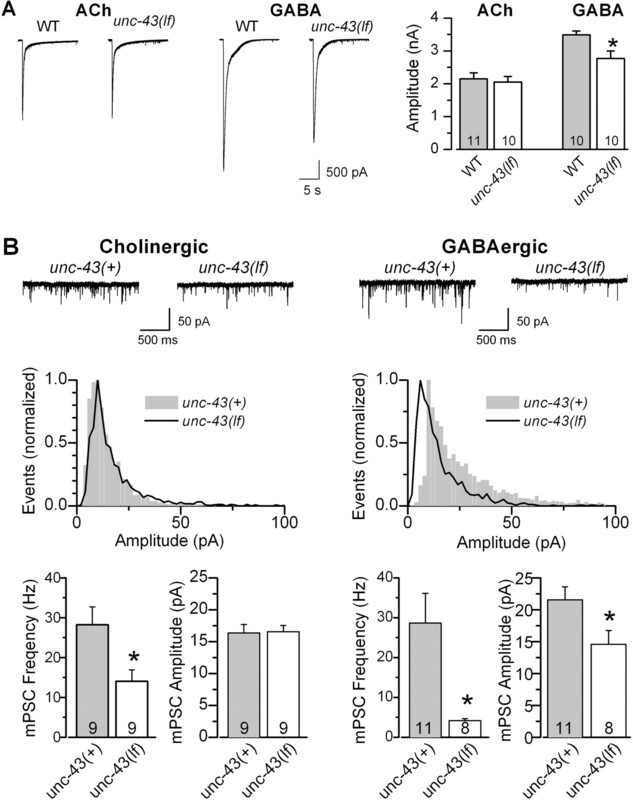 B, unc-43(lf) inhibited the mean amplitude of GABAergic but not cholinergic mPSCs. The effect of unc-43(lf) on cholinergic mPSCs was evaluated by comparing mPSCs between unc-49(e407) single mutant and unc-49(e407);unc-43(js125) double mutant, whereas that of unc-43(lf) on GABAergic mPSCs was evaluated by comparing mPSCs between wild type and unc-43(js125) in the presence of tubocurarine (0.5 mm). Representative current traces (top) and normalized amplitude histograms (middle) of cholinergic and GABAergic mPSCs are shown separately. unc-43(lf) had no effect on the distribution of cholinergic mPSCs but shifted the distribution of GABAergic mPSCs toward lower amplitudes. In the bar graphs of both A and B, all values are shown as the mean ± SE. The asterisk indicates statistically significant difference (p < 0.05, unpaired t test). The number of samples analyzed is indicated inside each column. We evaluated the function of presynaptic CaMKII in neurotransmitter release by analyzing gf and lf mutants of unc-43. The use of unc-43 mutants in the analyses offered two major advantages. First, potential complications by some nonspecific effects of CaMKII inhibitors (Tokumitsu et al., 1990; Sumi et al., 1991; Mochizuki et al., 1993; Enslen et al., 1994; Ledoux et al., 1999) were avoided. Second, the function of CaMKII could be evaluated under both gf and lf conditions. Our analyses show that presynaptic UNC-43 is a bidirectional modulator of neurotransmitter release. Presumably, the net effect of wild-type UNC-43 on neurotransmitter release would vary in vivo depending on physiological conditions. The two different roles of presynaptic UNC-43 in neurotransmitter release are likely mediated by phosphorylation of different target proteins. The main focus of the present study was to identify the molecular target through which presynaptic UNC-43 downregulates neurotransmitter release. In C. elegans, SLO-1 appears to be a uniquely important K+ channel in regulating neurotransmitter release. In a genetic screen designed to identify negative regulators of synaptic transmission, six independent alleles were isolated for slo-1 but none for any of the other >60 K+ channel genes of C. elegans (Wang et al., 2001). 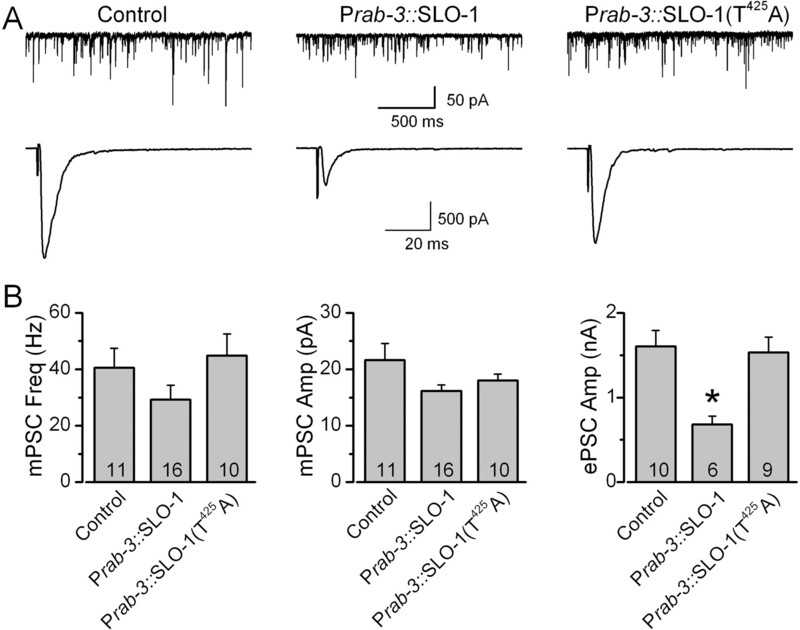 slo-1(lf) causes increased ePSC duration and quantal content (when ePSC amplitude is small) but does not change mPSC amplitude, which is consistent with deficiency of a negative regulator of neurotransmitter release (Wang et al., 2001). In the present study, slo-1(lf) specifically antagonized the inhibitory effect of unc-43(gf) on neurotransmitter release, suggesting that SLO-1 and UNC-43 function in a common molecular pathway. Our conclusion that UNC-43 may downregulate neurotransmitter release through SLO-1 is also supported by several lines of indirect evidence from previous studies: (1) in vivo expression patterns of SLO-1 and UNC-43 essentially overlap (Reiner et al., 1999; Wang et al., 2001); (2) lf mutants of both slo-1 and unc-43 have been isolated in the same genetic screen as suppressors of the lethargic phenotype of a hypomorphic syntaxin mutant (Wang et al., 2001; Hawasli et al., 2004); and (3) lf mutants of both slo-1 and unc-43 are hypersensitive to the cholinesterase inhibitor aldicarb (Wang et al., 2001; Hawasli et al., 2004). Because SLO-1 dysfunction completely reversed the inhibitory effect of unc-43(gf) on neurotransmitter release, SLO-1 is likely the primary molecular target through which presynaptic UNC-43 downregulates the release. The frequency of mPSCs at the C. elegans NMJ is Ca2+-dependent (Richmond et al., 1999; Liu et al., 2005). In the present study, unc-43(gf) inhibited ePSC amplitude but showed no effect on either mPSC amplitude or frequency. The differential effects of unc-43(gf) on ePSCs and mPSCs could be explained by different activities of SLO-1 at rest and during evoked responses. A number of studies have shown that the activity of BK channels is tightly controlled by colocalized voltage-gated Ca2+ channels (Yazejian et al., 1997; Marrion and Tavalin, 1998; Davies et al., 1999; Yazejian et al., 2000; Edgerton and Reinhart, 2003; Sun et al., 2003; Goldberg and Wilson, 2005; Berkefeld et al., 2006). In the absence of Ca2+ nanodomains created by Ca2+ influx through Ca2+ channels, BK channels are minimally activated despite significant membrane depolarization (Berkefeld et al., 2006). Thus, SLO-1 activity might be very low at rest because of minimal Ca2+ influx but increases considerably during evoked responses as a result of activation of colocalized Ca2+ channels. Although mutants of unc-103, goa-1, dgk-1, eat-11, or eat-16 may suppress several behavioral phenotypes of unc-43(gf) (Reiner et al., 1999; Robatzek and Thomas, 2000), analyses of lf mutants of unc-103 and two key genes (dgk-1 and eat-16) in the Go/Gq signaling network suggest that presynaptic UNC-43 does not downregulate neurotransmitter release through UNC-103 or the Go/Gq signaling network at the NMJ. Thus, there is limitation in judging NMJ transmission simply by examining animal behaviors. Consistent with this notion, we found that slo-1(lf) did not appreciably improve the locomotion of unc-43(gf) despite its effect on neurotransmitter release (data not shown), suggesting that the locomotion defect of unc-43(gf) was not simply attributable to reduced neurotransmitter release at the NMJ. Several studies have suggested that the BK channel might be activated by CaMKII (Muller et al., 1996; Sansom et al., 2000; Nelson et al., 2005). However, it is unclear whether the activation is attributable to direct phosphorylation of the channel or through a regulatory protein of the channel. The fact that T425A mutation abolished SLO-1 activation by CaMKII in Xenopus oocytes suggests that UNC-43 likely activates SLO-1 by directly phosphorylating the channel protein. This putative CaMKII phosphorylation site is located in the first RCK domain of the BK channel, which plays key roles in Ca2+-dependent channel gating (Jiang et al., 2001, 2002; Krishnamoorthy et al., 2005; Santarelli et al., 2006). Interestingly, T425 is only three residues upstream of a conserved glutamate residue (E399 in mSlo, the mouse BK channel), which, when mutated to alanine, increases mSlo V50 at nonphysiologically high Ca2+ concentrations (≥1 mm) (Xia et al., 2002). In the present study, T425 phosphorylation-dependent SLO-1 activation was observed at a much lower Ca2+ concentration (100 μm). It is possible that this effect of T425 phosphorylation might occur at even lower Ca2+ concentrations, which were not tested because 100 μm Ca2+ is required to fully activate UNC-43 (Umemura et al., 2005). Thus, SLO-1 T425 might play a physiological role in controlling Ca2+-dependent activation of the channel by changing its phosphorylation state, whereas SLO-1 E428 (equivalent of E399 in mSlo) might have a weak coordinating effect through electrostatic interactions. Consistently, we found that SLO-1(T425A) mutation abolished the inhibitory effect of unc-43(gf) on neurotransmitter release at the NMJ. Thus, UNC-43 appears to phosphorylate SLO-1 at T425 to downregulate neurotransmitter release at the NMJ. The inhibition of neurotransmitter release in unc-43(lf) is likely attributable to deficiency of an UNC-43-dependent positive regulator(s) of the release. CaMKII has been shown to phosphorylate several presynaptic proteins implicated in neurotransmitter release, including synapsins (Greengard et al., 1993), rabphilin (Fykse et al., 1995), synaptotagmin (Hilfiker et al., 1999), synaptobrevin (Nielander et al., 1995), and synaptophysin (Rubenstein et al., 1993). Phosphorylation of synapsin is thought to promote synaptic vesicle translocation from the reserve pool into the readily releasable pool (Benfenati et al., 1992). Physiological significance of CaMKII-dependent phosphorylation of the other proteins is mostly unknown. The molecular target(s) through which presynaptic UNC-43 enhances neurotransmitter release remains to be identified. In summary, the present study shows that gain-of-function of presynaptic UNC-43 may inhibit neurotransmitter release by activating SLO-1 at the C. elegans NMJ. Given that both CaMKII and BK channels are enriched at the presynaptic nerve terminal, and that BK channel is a key negative regulator of neurotransmitter release (Robitaille et al., 1993; Wang et al., 2001; Raffaelli et al., 2004), the regulation of BK channels by presynaptic CaMKII is likely an important physiological mechanism in controlling neurotransmitter release and synaptic strength. However, the functions of presynaptic CaMKII and BK channel could potentially vary from synapse to synapse. It would be interesting to know whether the regulation of neurotransmitter release by CaMKII through the BK channel is a common synaptic mechanism. This work was supported by National Institutes of Health Grant R21 MH070739 and National Science Foundation Grant 0619427 (Z.-W.W.). We thank Michael Nonet, James Thomas, and Caenorhabditis Genetics Center for mutant strains; Joshua Kaplan for a yfp::unc-43 cDNA plasmid; Ulrich Bayer and Howard Schulman for a rat CaMKII α-subunit cDNA plasmid; Erik Jorgensen for a Punc-47::RFP plasmid; and Aguan Wei for suggestions about this manuscript. (1988) Effects of charybdotoxin, a blocker of Ca2+-activated K+ channels, on motor nerve terminals. Br J Pharmacol 95:1329–1335. (1999) The Caenorhabditis elegans unc-49 locus encodes multiple subunits of a heteromultimeric GABA receptor. J Neurosci 19:5348–5359. (1992) Synaptic vesicle-associated Ca2+/calmodulin-dependent protein kinase II is a binding protein for synapsin I. Nature 359:417–420. (2006) BKCa-Cav channel complexes mediate rapid and localized Ca2+-activated K+ signaling. Science 314:615–620. (1995) The α-Ca2+/calmodulin kinase II: a bidirectional modulator of presynaptic plasticity. Neuron 14:591–597. (1999) Electrophysiological roles of L-type channels in different classes of guinea pig sympathetic neuron. J Neurophysiol 82:818–828. (2003) Distinct contributions of small and large conductance Ca2+-activated K+ channels to rat Purkinje neuron function. J Physiol (Lond) 548:53–69. (1994) Characterization of Ca2+/calmodulin-dependent protein kinase IV. Role in transcriptional regulation. J Biol Chem 269:15520–15527. (2006) WormBook, Transformation and microinjection. E-book available at http://www.wormbook.org. (1988) Multiple types of voltage-dependent Ca2+-activated K+ channels of large conductance in rat brain synaptosomal membranes. Biophys J 53:919–934. (2005) Control of spontaneous firing patterns by the selective coupling of calcium currents to calcium-activated potassium currents in striatal cholinergic interneurons. J Neurosci 25:10230–10238. (1999) Antagonism between Goα and Gqα in Caenorhabditis elegans: the RGS protein EAT-16 is necessary for Goα signaling and regulates Gqα activity. Genes Dev 13:1780–1793. (1989) Expression of a multifunctional Ca2+/calmodulin-dependent protein kinase and mutational analysis of its autoregulation. Neuron 3:59–70. (2004) Resistance to volatile anesthetics by mutations enhancing excitatory neurotransmitter release in Caenorhabditis elegans. Genetics 168:831–843. (1999) Regulation of synaptotagmin I phosphorylation by multiple protein kinases. J Neurochem 73:921–932. (2003) Essential function of alpha-calcium/calmodulin-dependent protein kinase II in neurotransmitter release at a glutamatergic central synapse. Proc Natl Acad Sci USA 100:4275–4280. (1994) Clustering of Ca2+ channels and Ca2+-activated K+ channels at fluorescently labeled presynaptic active zones of hair cells. Proc Natl Acad Sci USA 91:7578–7582. (2001) Structure of the RCK domain from the E. coli K+ channel and demonstration of its presence in the human BK channel. Neuron 29:593–601. (2005) Domains, amino acid residues, and new isoforms of Caenorhabditis elegans diacylglycerol kinase 1 (DGK-1) important for terminating diacylglycerol signaling in vivo. J Biol Chem 280:2730–2736. (1995) Effects of Ca2+ channel blockers on transmitter release and presynaptic currents at the frog neuromuscular junction. J Physiol (Lond) 486:695–706. (1996) Distribution of high-conductance Ca2+-activated K+ channels in rat brain: targeting to axons and nerve terminals. J Neurosci 16:955–963. (2005) The NH2 terminus of RCK1 domain regulates Ca2+-dependent BKCa channel gating. J Gen Physiol 126:227–241. (1989) Identification of ionic currents at presynaptic nerve endings of the lizard. J Physiol (Lond) 414:201–222. (2002) The molecular basis of CaMKII function in synaptic and behavioural memory. Nat Rev Neurosci 3:175–190. (1985) Intraterminal injection of synapsin I or calcium/calmodulin-dependent protein kinase II alters neurotransmitter release at the squid giant synapse. Proc Natl Acad Sci USA 82:3035–3039. (1998) Selective activation of Ca2+-activated K+ channels by co-localized Ca2+ channels in hippocampal neurons. Nature 395:900–905. (1997) Large conductance voltage- and calcium-dependent K+ channel, a distinct member of voltage-dependent ion channels with seven N-terminal transmembrane segments (S0–S6), an extracellular N terminus, and an intracellular (S9–S10) C terminus. Proc Natl Acad Sci USA 94:14066–14071. (1995) DNA transformation. Methods Cell Biol 48:451–482. (2006) Immunolocalization of the Ca2+-activated K+ channel Slo1 in axons and nerve terminals of mammalian brain and cultured neurons. J Comp Neurol 496:289–302. (1993) Purification and characterization of Ca2+/calmodulin-dependent protein kinase V from rat cerebrum. J Biol Chem 268:9143–9147. (1990) Evidence for two calcium-dependent potassium conductances in lizard motor nerve terminals. J Neurosci 10:2614–2625. (1996) State-dependent modulation of mSlo, a cloned calcium-dependent potassium channel. Neuropharmacology 35:877–886. (2005) Decreases in CaMKII activity trigger persistent potentiation of intrinsic excitability in spontaneously firing vestibular nucleus neurons. Neuron 46:623–631. (1995) Phosphorylation of VAMP/synaptobrevin in synaptic vesicles by endogenous protein kinases. J Neurochem 65:1712–1720. (2002) Regulation of neuronal excitability in Drosophila by constitutively active CaMKII. J Neurobiol 52:24–42. (2002) An N-terminal region of Caenorhabditis elegans RGS proteins EGL-10 and EAT-16 directs inhibition of Gαo versus Gαq signaling. J Biol Chem 277:47004–47013. (2004) BK potassium channels control transmitter release at CA3-CA3 synapses in the rat hippocampus. J Physiol (Lond) 557:147–157. (1999) Diverse behavioural defects caused by mutations in Caenorhabditis elegans unc-43 CaM kinase II. Nature 402:199–203. (2006) Behavioral genetics of Caenorhabditis elegans unc-103-encoded erg-like K+ channel. J Neurogenet 20:41–66. (1999) One GABA and two acetylcholine receptors function at the C. elegans neuromuscular junction. Nat Neurosci 2:791–797. (2000) Calcium/calmodulin-dependent protein kinase II regulates Caenorhabditis elegans locomotion in concert with a Go/Gq signaling network. Genetics 156:1069–1082. (2001) eat-11 encodes GPB-2, a Gβ5 ortholog that interacts with Goα and Gqα to regulate C. elegans behavior. Curr Biol 11:288–293. (1999) CaMKII regulates the density of central glutamatergic synapses in vivo. Nature 402:195–199. (1993) Calcium-dependent serine phosphorylation of synaptophysin. Synapse 13:161–172. (2000) Regulation of Ca2+-activated K+ channels by multifunctional Ca2+/calmodulin-dependent protein kinase. Am J Physiol 279:F283–F288. (2006) Three methionine residues located within the regulator of conductance for K+ (RCK) domains confer oxidative sensitivity to large-conductance Ca2+-activated K+ channels. J Physiol (Lond) 571:329–348. (1991) Calcium-activated potassium conductance in presynaptic terminals at the crayfish neuromuscular junction. J Gen Physiol 98:1161–1179. (1988) in The nematode Caenorhabditis elegans, Methods, ed Wood WB, Community of C. elegans Researchers (Cold Spring Harbor Laboratory, Cold Spring Harbor, NY), pp 587–606. (1991) The newly synthesized selective Ca2+/calmodulin dependent protein kinase II inhibitor KN-93 reduces dopamine contents in PC12h cells. Biochem Biophys Res Commun 181:968–975. (2003) Calcium influx via L- and N-type calcium channels activates a transient large-conductance Ca2+-activated K+ current in mouse neocortical pyramidal neurons. J Neurosci 23:3639–3648. (1999) Single-channel properties of BK-type calcium-activated potassium channels at a cholinergic presynaptic nerve terminal. J Physiol (Lond) 518:639–651. (1989) Three potassium currents in mouse motor nerve terminals. Pflügers Arch 413:395–400. (1990) KN-62, 1-[N,O-bis(5-isoquinolinesulfonyl)-N-methyl-l-tyrosyl]-4-phenylpiperazine, a specific inhibitor of Ca2+/calmodulin-dependent protein kinase II. J Biol Chem 265:4315–4320. (2005) The role of regulatory domain interactions in UNC-43 CaMKII localization and trafficking. J Cell Sci 118:3327–3338. (1995) Modulation of acetylcholine release at mouse neuromuscular junctions by interaction of three homologous scorpion toxins with K+ channels. Br J Pharmacol 114:1502–1506. (2002) Calcium/calmodulin-dependent protein kinase II phosphorylates and regulates the Drosophila eag potassium channel. J Biol Chem 277:24022–24029. (1993) Maxi-K+ channel in single isolated cochlear efferent nerve terminals. Hear Res 66:123–129. (2002) Multiple regulatory sites in large-conductance calcium-activated potassium channels. Nature 418:880–884. (1997) Direct measurements of presynaptic calcium and calcium-activated potassium currents regulating neurotransmitter release at cultured Xenopus nerve-muscle synapses. J Neurosci 17:2990–3001. (2000) SLO-2, a K+ channel with an unusual Cl− dependence. Nat Neurosci 3:771–779. (1999) A dynamically regulated 14-3-3, Slob, and Slowpoke potassium channel complex in Drosophila presynaptic nerve terminals. Neuron 22:809–818.